If you’re trying to get your Android phone or tablet to interact with your Windows 10 PC, you need to know several tricks. First, just plug it in. Every Android device can connect to a USB port. 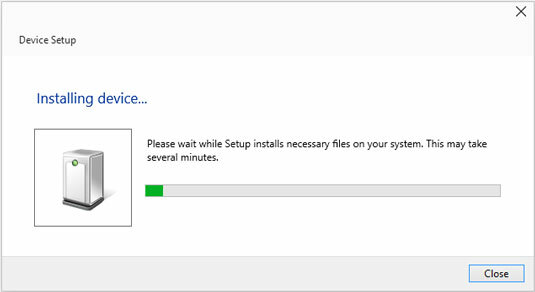 Chances are good that Windows will recognize the device and install a driver for it. You get a dialog box like the one shown. With any luck at all, your Android device installs itself. All you have to do is plug it in. After it’s installed, you can access all the files on the Android device through File Explorer. A Samsung Galaxy Note 3 looks like the following figure. Photos are in the folder \Phone\DCIM\Camera. If the device installs properly, you can get at files through Windows File Explorer. From File Explorer, you can cut or copy files, moving them to your PC. You can edit or delete them. And you can print them. 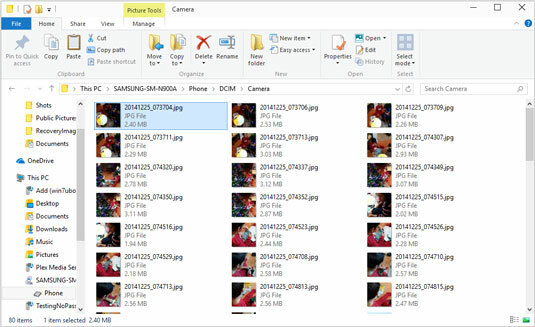 Copying files from your computer onto your Android device, using File Explorer, usually works. Your device, and mileage, may vary. Don’t delete any precious photos until you know for sure that they’ve been transferred properly. Take it from a pro: For photos, it’s much easier to enable Google Photos on your PC, phone, and tablet. Google takes care of all the syncing details.